Quiescit anima libris. The spirit finds rest in books (and in museum objects, archival photographs, and garden sculpture). This is a Dumbarton Oaks project. For more about Dumbarton Oaks, visit www.doaks.org. 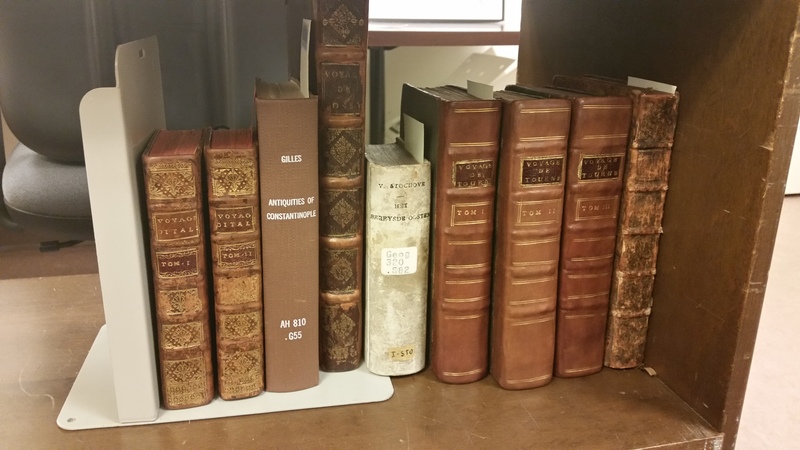 This post is provided by Anne Marie Creighton, who joins us this year as a research fellow in the Dumbarton Oaks Library. For the past month, I have been leafing through centuries-old books. My task? To take notes on those rare books at Dumbarton Oaks that pertain to the Byzantine heritage of Ottoman Constantinople, recording my summaries of their illustrations, condition, and contents. So far, I have gone through between three and five thousand pages, depending on how you count them, in a dozen books in English, French, Spanish, Italian, Dutch, and Latin. I am approaching this project in chronological order, so to date I have worked with books published between 1545 and 1700. Among these books, I have been dismayed to learn how easily the leather of a cracking spine can leave red dust marks on my gloves, and I have gotten to know the delight of discovering passages and illustrations that surprise and charm, like the two engravings I’m sharing here today. As an aside, I need to emphasize that I am not reading all of these books—I don’t even know all the languages in which they’re written. I have sometimes ended up doing a lot of reading to figure out books that proved particularly challenging, but, in general, the combination of a book’s table of contents, some light skimming, and modern studies of the book does the trick. I cannot emphasize enough what a wonderful advance the table of contents forms in the history of communication. Indexes, too. The impetus for this post, however, comes from the Pre-Columbian Studies program in Dumbarton Oaks’ rare book collections—when our last shipment of books for digitization returned from Harvard, Bridget Gazzo, the Librarian for Pre-Columbian Studies, pointed out a fabulous pair of images to me that now lie at the end of this post. These images, an engraving of an astronomer and the original pencil drawing on which the engraving was based, got me thinking about the process of printing images. After that, I found an image from a book in my Byzantine work that also, I thought, brought home the humanity of the people who made the volume, even so many centuries later. The two books also make a good match because their authors—Charles du Fresne, sieur du Cange, a Byzantinist, and Charles-Marie de La Condamine, an astronomer—were both titans in their respective fields. I suppose it is also a testament to the culture of scholarship in early modern France that these two men were experts in topics as varied as Byzantine studies and astronomy! A page of coins. Charles du Fresne du Cange, Historia Byzantina, before p. 1 [2nd set]. This engraving is from the Historia Byzantina of Charles du Cange, which is one of the foundational modern texts for the study of Byzantine history. Du Cange was a French nobleman in the seventeenth century with deep interests in medieval and classical studies. He has the rare honor of being called the father of two academic fields—both Byzantine and medieval Latin studies. Byzantine numismatics was among Du Cange’s many interests, so the thousand-odd page Historia includes about fifty pages of illustrations of coins, like this one. 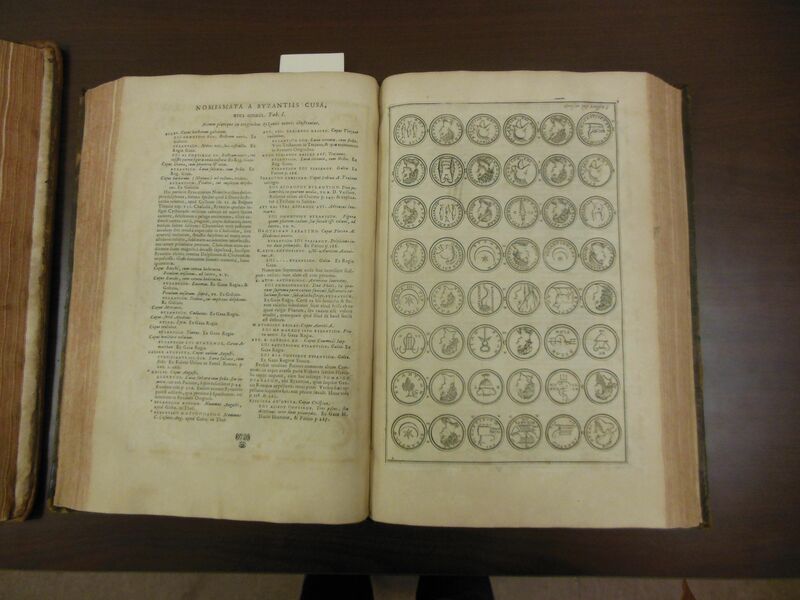 After seeing so many coins, I was starting to pay a little less attention, until we discovered the page above. Printing an early modern engraving was a tricky business. In the period of this book, ink had to be made carefully, by hand, and often, so that it would stay fresh. Applying the ink to a carved wood block or an engraved metal plate that would create the image was another task, as was properly dampening the page. Ink would leave only a faint image on a page that was too dry; a page that was too wet, meanwhile, would cause the ink to smudge, or the paper itself to crease. Sometimes, accustomed to modern books, I forget how much human labor was required to make books like this one. 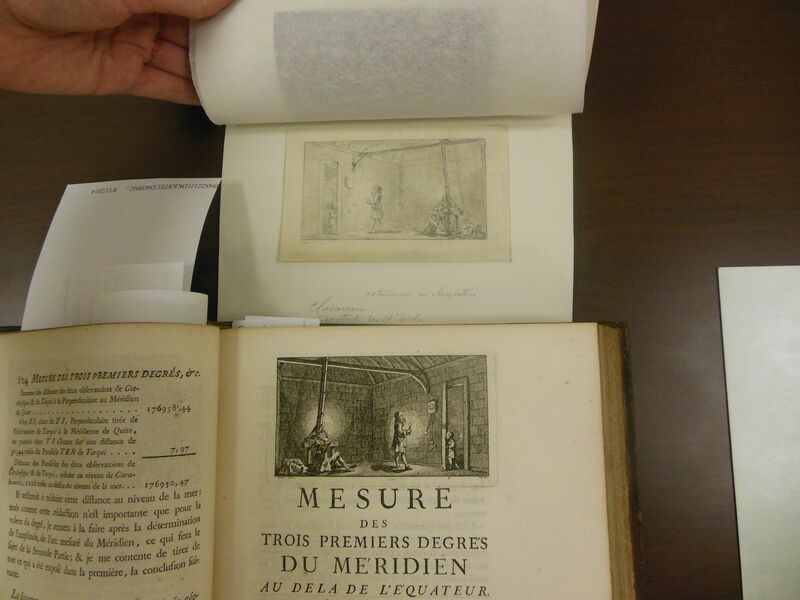 This error—whether the plate was printed upside down or whether, once printed, it was bound into the book incorrectly—makes the process of making these books seem more vivid to me. An astronomer makes observations. Charles-Marie de La Condamine, Mesure des trois premiers degrés du méridien dans l’hémisphere austral, 105. This image, which Bridget pointed out to me, is the reason I started thinking about engravings this week in the first place. It comes from a title that records one of the most important eighteenth-century scientific expeditions in South America, one that set out to get south of the equator so that the members of the expedition could measure the shape of the earth. On the title page for La Condamine’s work about this effort, therefore, an engraving shows an astronomer taking measurements at night, hard at work by candlelight. Printing an image like this almost always required the artistic services of both an artist – in this case P. Clavareau – and an engraver. 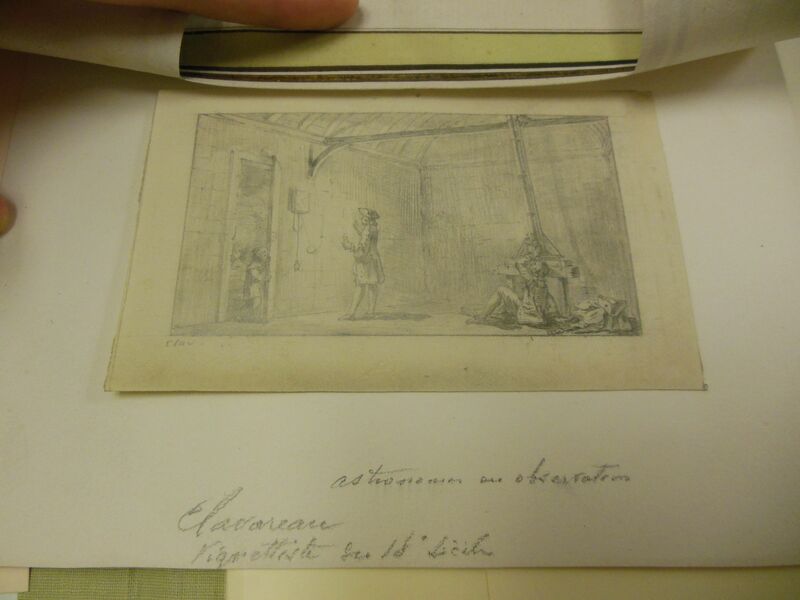 By happy circumstance, Dumbarton Oaks has both Clavareau’s drawing and the engraver’s rendering of it. “astronome par observation” (?) Pencil drawing by P. Clavareau. See the end of this post for bibliographic information. You can see how differently textures work in graphite, even graphite done to preview an engraving, and in a print like this one. Graphite is soft, and can create flat shaded surfaces, uniformly gray, while the engraving requires that black be created through narrow lines, which even in the deepest shadows alternate white and dark. Here are the two images side by side. Notice that they are the same size, and mirror images of each other. These are both characteristic of the way engravings like these were printed. To see more about this book, don’t neglect to look at the fully digitized copy! Charles du Fresne du Cange, Historia Byzantina duplici commentario illustrata (Lutetiae Parisiorum: Apud Ludovicium Billaine, 1680), [HOLLIS]. 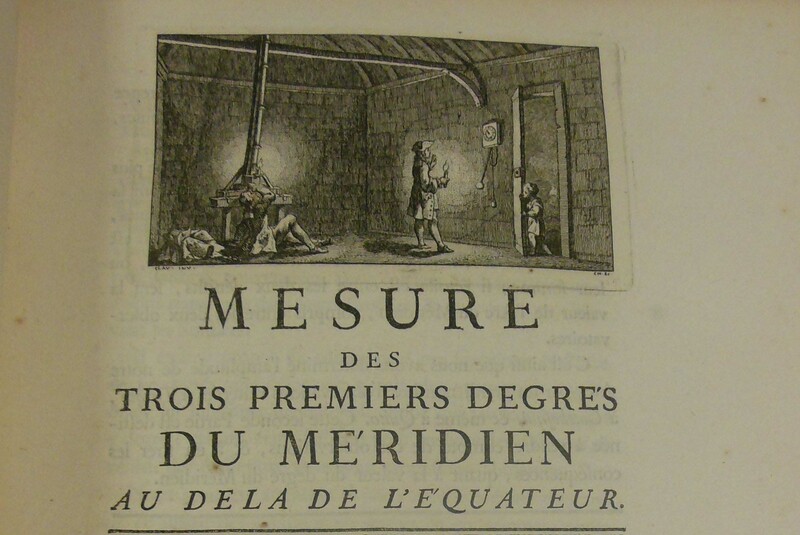 Charles-Marie de La Condamine, Mesure des trois premiers degrés du méridien dans l’hémisphere austral, (Paris: De l’Imprimerie royale, 1751) [HOLLIS]. The HOLLIS record also includes further information about the drawing. The digitized version of this book is available here.